Black & Decker is confident of the quality of its products and offers an outstanding guarantee for professional users of the product. This guarantee statement is in addition to, and in no way prejudices your contractual rights. The guarantee is valid within the territories of the Member States of the European Union and the European Free Trade Area. If your Black & Decker product becomes defective due to faulty materials or lack of conformity within 24 months from the date of purchase, Black & Decker guarantees to replace all defective parts, repair products, subjected to fair wear and tear, to make sure of the minimum inconvenience to the customer, unless, the product has not been used for trade, professional or hire purposes, the product has been subject to misuse or neglect or the product has sustained damage through foreign objects, substances or accidents. In order to make a claim, you will need to submit proof of purchase and your product must display the CE mark. 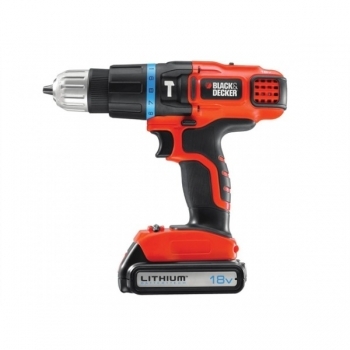 The Black & Decker EGBL188 2 Gear Hammer Drill has the power and speed to drill into masonry, steel and wood. It has an 11 position clutch for perfect screwdriving into a variety of materials with different screw sizes. Variable speed provides ultimate fingertip control for all drilling and screwdriving applications. The EGBL188 has two gears for high and low speed drilling and screwdriving: First gear provides greater torque and control; second gear provides greater speed. An anti slip soft grip gives comfort when using the drill. The Lithium Ion battery holds over 80% of its charge over 90 days whilst idle, meaning there is no need to charge the unit before each use. The spring loaded battery system allows quick and simple battery change and a more secure fit. For all drilling tasks in Masonry and Concrete up to 10mm. For all drilling tasks in Wood up to 25mm. For all drilling tasks in Metal up to 10mm. Hanging Pictures, Shelves, Curtain Rails, Blinds. Drilling capacity: Wood: 25mm. Steel: 10mm. Masonry: 10mm. No load speed: 0-400/0-1350 rpm.